Chromed Bird twitter extension for Google Chrome(Chromium) can do everything one ever expects to do with a Twitter extension and more. I wanted an extension with similar functionality for Facebook. And I got Facebook To-Go. I have to say, Chromed Bird and Facebook To-Go is an awesome must-have combination of social media extensions for Google Chrome. Super light weight. It won't eat up your memory. Change your status, see your wall or that of others and post to wall capabilities. Live feed which is new. Read-write messages, view photos and much more. 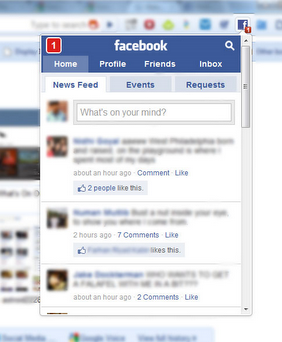 Install Facebook To-Go Google Chrome Extension right now!